Superb penthouse apartment on Bexill seafront with panoramic sea views. This lovely apartment is beautifully presented and extremely comfortable, with two sitting rooms, one with a balcony so everyone can relax and enjoy the views. Within walking distance of the town and all amenities. Size: Sleeps 3 Nearest beach: 0 miles Nearest amenities: 0 miles Pets: No pets allowed at this property Short breaks: Allowed at this property Smoking: Not allowed at this property Luxuries: DVD player General: Gas central heating Standard: Kettle, toaster, iron Utilities: Combination microwave, electric oven and hob, fridge/freezer, dishwasher and washer/dryer Rooms: 2 sitting rooms one with dining table and chairs, kitchen, 1 shower room, 2 bedrooms Beds: 1 double and 1 single Other: Bedlinen and towels provided Outdoors: Balcony Parking: Two hours on street next to building, free on seafront and neighbouring streets. £30 security deposit for stair lift.Sorry - no children under 12 due to low balcony rail - as a listed building it cannot be changed/raised. No children under 10 years of age due to low balcony rails. 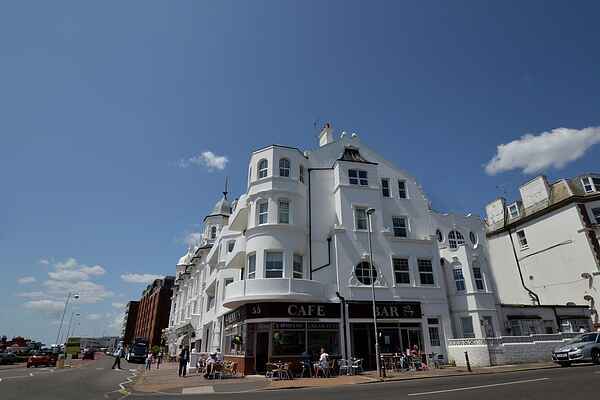 Parking: Free for 2 hours on Sea Road and totally free on the seafront or neighbouring streets.